Corruption is present in today’s world more than we know, and sometimes, even more than we would like to admit. Many institutions fall victim to the greed of promises towards financial rewards, often not taking in consideration the long term fallout caused by the simplest acts of corruption. In an attempt to create awareness for the present and future generations of Kosovo with an aim of minimizing corruption, UNDP and IPKO Foundation have come together in creating a fun event – Game Over, Corruption!. This event encouraged game enthusiasts and developers towards creating educational games with the aim of teaching players about the negative sides of corruption and how to minimize it. All lovers and developers of mobile games were invited to apply, with only their imagination being the limit to what kind of game they could come up with. Two winning teams were awarded the sum of 4,000 Euro each, to aid them in fully developing their games. On the 23rd of December 2016, the ODA Theatre hosted more than 90 participants who were part of the audience and were there to see what the speakers and pitching teams had in store for them. Game Over, Corruption!’s agenda was comprised of 3 speaker sessions, each presenting their idea and motivation behind their love for games, together with an inspiring message towards anti-corruption efforts! Agnesa Belegu was the first speaker, who kicked off the event with an inspiring talk about her childhood friends – games! She went on to explain that, as a girl, she faced a lot of de-motivation when pursuing her career in gaming design and development. She encouraged the audience to keep following their dreams and motivation in the field of games, because an individual can learn many things from them. Besides posing as a great time consumer, games for Agnesa were a great source if mental and spiritual growth. In her perspective, corruption was a plague that needed rooting out, and it is up to us to do so. It is up to the game developers of tomorrow to take on the responsibility of educating the growing minds of the future, and helping them by creating a version of reality that teaches them about an ideal, corruption-free system. Agon Avdimetaj from Zombie Soup was the following speaker, who shared his takes on gaming and education. In Agon’s opinion, people who might lack academically in certain areas of education often times show great positive advancements when it comes to learning through games. According to Agon, Games have the ability to help convey an honest opinion against corruption, and the future of gaming lies in VR – Virtual Reality. Many companies have been investing in the VR department, and in the future games will be based on VR much more than they are today. This will be a great opportunity for the developers of the future to create VR games and provide a mind-blowing reality, all the time educating the audience against corruption. The final speaker, Fjona Cakalli, was by no means a princess like her online names might make you think. She named herself a “princess” in the online world with the sole purpose of provoking the community into discussion, and at the same time proving that as a princess she didn’t need saving – she was her own savior. Fjona also presented her experiences in video-logging about games, and how she used those experiences to become a journalist in itally. The presenting team names were: Scope, Illustrarium, Detectives Legion, Rogue Three, DevBro’s, Shefat, and ZeroC, all gave the judging panel a hard with amazing game concepts and game presentations. 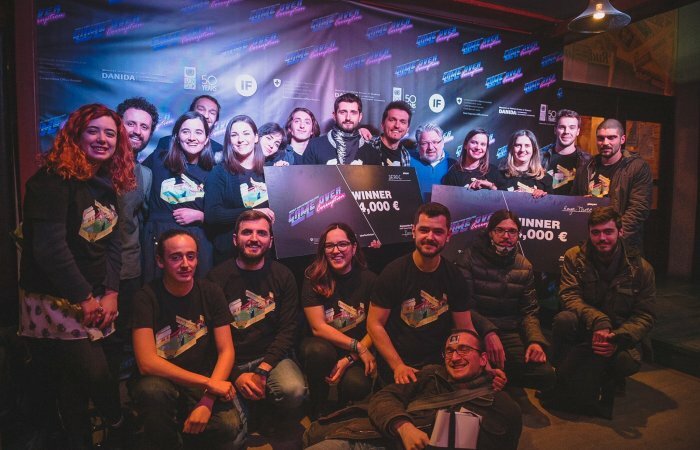 After a short meeting, the decision was made and ZeroC and Rogue Three were selected as the winners of the competition, awarding them 4,000 Euro each with the aim of helping them to financially develop their game and come up with a final product. This project was a part of UNDP’s Support to Anti-Corruption Efforts (SAEK) project in cooperation with IPKO Foundation, and was funded by Swiss Agency for Development and Cooperation (SDC) and the Danish Development Agency(DANIDA).